"We enjoyed playing Tag Rugby with Ray over the past three weeks. During week one we learned the basics of having to pass the ball behind you and how to use the tags. We played tag chasing and loved it! After a week of rest we played bulldog except in a Tag Rugby way and we also played matches. Week three was lots of matches and lots of fun! I enjoyed my weeks of Tag Rugby and I wish to play it again!" Ellen S.
"I love our new computer room! It has enough brand new computers for everyone in the class. We have played learning games that are so much fun like Maths games, Geography games and more! I can see our class using the computers to look up things for projects and homework. The computer room is also very good because of the touch screen board at the front of the room where the teacher can show us what we are supposed to be doing. I am having a great time learning in our computer room!" Poppy R.
" Over the past few weeks we learned all about the different types of home that animals and humans call their home. Some of the habitats we learned about included the Polar regions, the Savannah, the Rainforest, woodlands and beaches! We also looked at home through history in our locality. For our project we typed up a paragraph on what animal and habitat we planned to do on Google classroom. Then we made a mini-habitat for the animal that we chose and brought them into school. 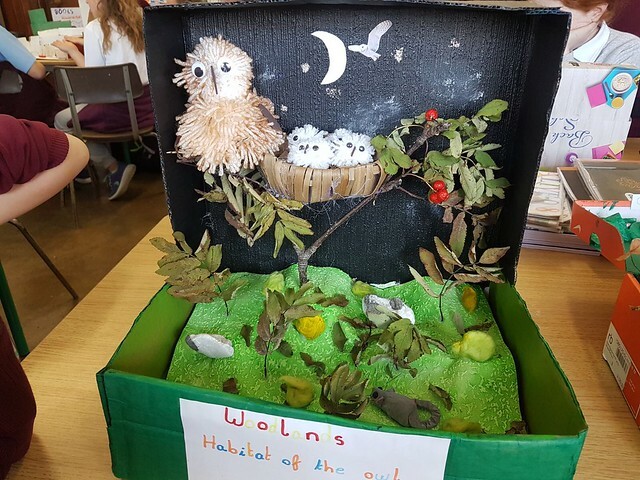 I, and everybody, in my class loved making, designing and learning about habitats and homes. It will be an experience I will never forget all through secondary school!" Ailbhe M.
Click on the image below to view some photographs..